If you can't participate with your own project but still would like to get involved, we'd love to have you join us. 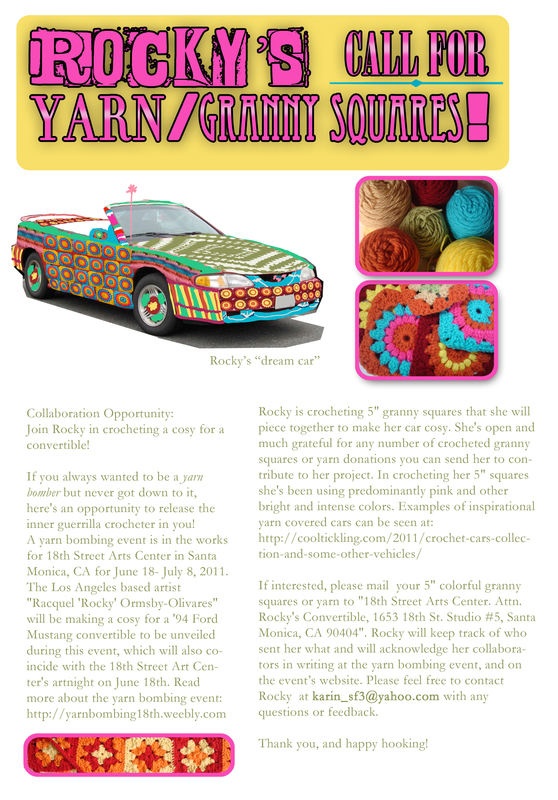 If you always wanted to be a yarn bomber but never got down to it, here's an opportunity to release the inner guerrilla crocheter in you... Rocky is crocheting a cosy for a convertible car out of 5" granny squares for June 18th. She's open to and much grateful for any number of crocheted granny squares or yarn you can send her to contribute to her project. You can email Rocky or mail to 18th Street Arts Center. Attn. Rocky's Convertible, 1653 18th St. Studio #5, Santa Monica, CA 90404. Please click here for more details.